This is about as good as it gets when it comes to compact desktop interfaces. Six in/six out interface. Solid build quality. Mac and Windows compatibility. Not ideal for band situations. There's been an explosion of high-quality desktop interfaces in the last few years. With ever increasing amounts of people turning to simple home set-ups, a solid set of converters coupled with a couple of stellar analogue inputs, remains as important as ever. 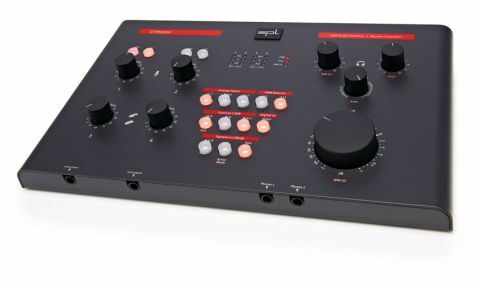 SPL is certainly no stranger to building excellent analogue kit but when we heard the price point of this new interface we were slightly concerned it wouldn't be able to deliver its usual level of build quality. "Even the knobs are a heavy brushed aluminium, with a seriously smooth action"
On prizing this generously sized unit out of its packaging the first thing that hit home was its weight - once this is in place on your desk it's not going anywhere. The Crimson's impressive bulk is mainly a result of it being completely constructed from metal. Even the knobs are a heavy brushed aluminium, with a seriously smooth action. This all adds up to a solid product that just feels bullet proof. Even the buttons (which are about the only plastic element here) are extremely sturdy and have a pleasing glow when engaged. So enough about build quality how does the Crimson sound and perform? The first thing you should know is that this interface is 100% hardware controlled. In short this means after a simple installation there is no software control panel or dedicated app to be found - everything is controlled via the hardware. Although this approach is a bit of a departure from the usual app featuring software mixer and extended settings, it is actually pretty refreshing and imparts a more immediate and reliable feel to proceedings. You want to change a level or mute a source? Hit a button and twiddle a knob, simple as that. When it comes to connectivity the Crimson is no slouch - a quick glance at the rear panel and you'll find a good array of inputs including mic pre-amps, line inputs, S/PDIF, RCA and even a mini jack for iOS devices. In reality the unit is capable of recording six inputs at once, four of those analogue. You can mix this configuration up however you want. An example set-up would be one microphone, three line inputs and the stereo digital S/PDIF. Add more mics and less lines if you like but this physical limit remains. All other analogue sources and inputs can also be monitored but not directly recorded. In most project studios this spec will cover most scenarios but if you are looking to record entire bands, short of adding a digital mixer to the S/PDIF input, this might not be quite what you're looking for. Having said that, the sound of the converters throughout was simply impeccable and comparable with Apogee, Universal Audio and RME units. The mic pres proved to be transparent with an extremely low noise floor and the whole system didn't hiccup once during testing. SPL deserves a real pat on the back here. For a first attempt at an audio interface this is nothing short of stunning and at this price point it's set to give similarly priced units a real run for their money.